I first discovered brown bread ice cream in an old copy of Mrs Beeton’s Everyday Cookery, and as an avid maker of simple ice cream and brown bread, decided to combine my two recipes. You don’t need an ice-cream maker for this one, I don’t own one. If you have an electric whisk or cake mixer, it will come in handy, but you can make this without – you just need a little patience and a firm hand. MAKES AROUND 8 PORTIONS from 23p each . This post is not sponsored; I provide links to the ingredients that I use so you can see how I calculate my recipe costs, and I may earn a small commission if you click the links or purchase any ingredients. All prices correct at the time of printing and are subject to change. Soak the bread in the milk and stand to one side for an hour or so. Beat the egg yolks in a large mixing bowl until pale and fluffy. Add the sugar and beat well. Pour in the cream and whisk until the mixture has almost doubled in size. Run a finger through: it should feel airy, light and fluffy, and not fall off your finger. A common mistake is to beat too hard, knocking the air out of it as quickly as you beat it in – you want a firm and rhythmic hand, but not too much vigour. It should stand in soft peaks when you lift your whisk out. If you scrimp on this step, your ice cream will set rock hard, and while it won’t be unpleasant, it will be that bit more difficult to eat. Drain the milk from the brown bread, give it a gentle squeeze and tear it into small pieces. Fold it through the whipped cream mixture with the sultanas. Pour it into a loaf tin or plastic container. Mix together the breadcrumbs, sugar and cinnamon and scatter over the top (if you forget this stage, you can do it just before serving). Cover the container with a lid or cling film to seal, and freeze for at least 4 hours. Remove from the freezer 5 minutes before serving, to allow it to soften a little. Recipe from ‘Cooking On A Bootstrap’ by Jack Monroe. Photography by Mike English. Like this? Made it? Comment below! This site is free to those who need it, and always will be, but it does of course incur costs to run and keep it running. If you use it and benefit, enjoy it, and would like to keep it going, please consider popping something in the tip jar, and thankyou. 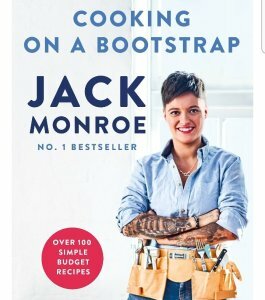 All text copyright Jack Monroe. 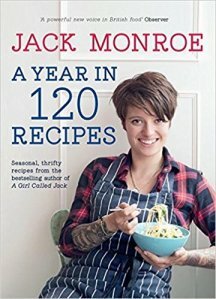 Jack Monroe is an award winning food writer and bestselling author. 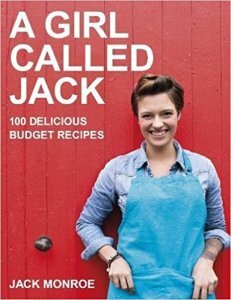 Books include A Girl Called Jack, A Year In 120 Recipes and Cooking On A Bootstrap. 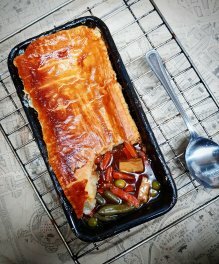 She has won the Fortnum & Mason Food and Drink award (ironically), the Observer Food Monthly Best Food Blog, Marie Claire 'Woman At The Top', Red Magazine's 'Red Hot Women', the YMCA Courage & Inspiration Award, the Woman Of The Year Entrepreneur award, the Women Of The Future media award and many more. She works with Oxfam, the Trussell Trust, Child Poverty Action Group, Plan Zheroes, the Food Chain and many food banks, schools and childrens centres to teach people to cook and eat well on a low income, and campaigns against the causes of poverty and austerity in Britain and abroad.